At last! A student-friendly, teacher-friendly workbook with study units for a full semester or year of classroom drama activities. The entire spectrum of theatre is covered in ten sections: 1. Getting Started, 2. Evaluation, 3. Scene Work, 4. Acting, 5. Characterization, 6. Publicity and Other Production Business, 7. Play Production, 8. Theatre History, 9. Games and Improvisation, 10. Planning for the Future. All units are complete with detailed instructions, examples, working forms, and photo illustrations. Students will learn all the basics of theatre history, play production, performing, and finding a career in theatre. Read more...This instructional program is classroom-tested and designed to fit the budgetary considerations of schools. Instructors will have the advantage of having the entire student handbook in their teacher’s guide plus much more! Besides “Notes to the Teacher” for each of the ten sections listed above, there’s almost a hundred extra pages just for the teacher, including teaching tools, evaluation tools, and production tools. These pages are loaded with reproducible handouts and forms. Most importantly, an entire section is dedicated to reproducible tests and major projects. Don’t worry — answers are provided to make teaching this class easy and fun! NOTE: Due to the weight of the teacher’s guide, your invoice will include a $3.00 Heavy Item Surcharge. Those who have already discovered the ease of teaching Theatre Arts with Suzi Zimmerman’s first textbook will be thrilled to learn she has come out with this sequel! This action handbook takes all the outstanding components you loved in the first book and applies it to seven new sections: 1. Theatre for Life’s Lessons, 2. Movement — Theatre for the Eyes, 3. Voice — Theatre for the Ears, 4. Skill-Building Activities — Theatre Projects, Mini-Units and Self-Guided Lessons, 5. Understanding and Writing Scripts, 6. Theatre Behind the Scenes, and 7. Production 101. Again, teachers will love having the entire student handbook in this teacher’s guide along with 120 additional pages of helpful information and tips. Besides the “Notes to the Teacher” at the beginning of each section, extra sample scripts and scoring rubrics are also included. 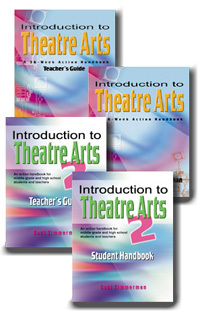 Finally, this guide, which makes teaching Theatre Arts easy and fun for everyone, contains four extensive special chapters: The Valuable Theatre Program, Theatre for Unique Learners, Theatre for Students Who Are Learning a New Language, and Guides and Helpers for Everything.